Main kylpyhuone ja kylpyamme yhdistelmä, wc ja handbasin. Yksityinen uima-allas ja aurinkoterassi, josta on upeat näkymät vuorille ja rannikolle. Eristäytynyt kypsä puutarha. Myös yksityinen turvallinen pysäköinti. Omistajat eivät asuvat paikan päällä, mutta erillisiä asuintiloista, pysäköintialue ja ovi. Kohtuullinen kunto on tarpeen, koska on olemassa joitakin toimia ja omaisuutta. Tupakointi on sallittu vain ulkona. We had a wonderful holiday at the finca. Very well equipped. 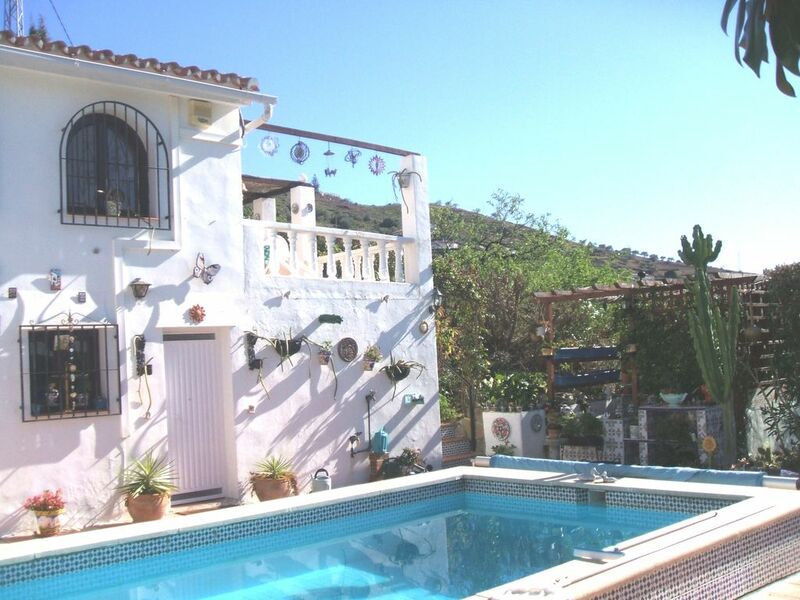 Stunning location with views of the sea and surrounding mountains. Lynne and Brian are lovely hosts. Would highly recommend. Très belle propriété, avec un cadre magnifique la maison est toute équipée et les propriétaires sont très a l'écoute. De la lessive au coton tout est fournis. L'intimité est garantie et la piscine est privatisée. Nous avons passé une excellente lune de miel. Nous recommandons vivement ! We just spent 2 weeks again in Finca Andaluz...and we just loved it again. Nothing to say apart that it is a very nice place for a couple to stay and just relax. Thanks to Lynne & Brian. Perfect place for Perfect Holidays ! My boyfriend and I have just returned from the most relaxing holiday ever at Finca Anduluz. If you need to rest, recharge your batteries and do nothing but decide which bikini to wear and whether the sunset is better than the night before then this is the place to go. The Villa and pool are totally private, beautifully situated on the side of a mountain, the view is amazing, you can see the sea in the distance from the pool. All you can hear are the bees, the cicadas and the occasional goat from down in the valley. No light pollution so great for seeing shooting stars.Total peace and tranquility. Carl, the manager was great, from initial email contact through to airport transfer, supermarket stop and restaurant booking! The owners Lynne and Brian were the perfect hosts. We only saw them when we needed something, which wasn't very often! Lovely people who made us very welcome and even gave us a lift into Competa for provisions. Competa is lovely, very quiet with some excellent restaurants but non could offer us a table with a view better than on the apartment terrace! We are already looking at dates for next year, if we can wait that long for a little bit more of heaven in Spain.